Please refer to our stock # TBD00198 when inquiring. 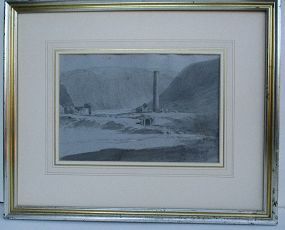 A pencil sketch of Glendalough county Wicklow Ireland with a strong attribution to the British artist Edward Lear (1812-1888). Drawn with pencil on bluish heavy laid paper with ink, ink washes, touches of white gouche and faded washes of green. In 1835 Lear visited Ireland, one of his early trips as he turned from bird illustration to landscape. The party he traveled with visited Glendalough. During his life Lear saved his sketches and it was not until the 1920’s that they were available. This sketch was presumably from a book with notes about the picture on the opposite side and the title was copied from the page opposite it and written in the block pencil letters. Drawing 9/ 38 X 13 ¾ inches. Frame 19 X 23 inches. Condition: generally good with a few foxing spots and a small tear on the lower left margin repaired with tape. The green wash is mostly faded. Lear’s landscapes of the Middle East are his most famous and in this early example of his work one can see the beginnings of the fluid style he employed so well.